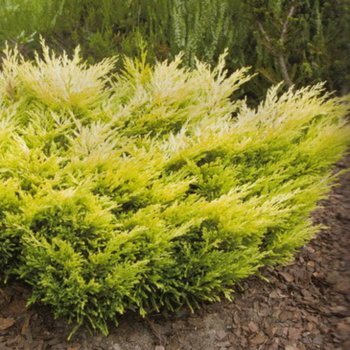 With bright lime green-yellow foliage that turns coppery-red in autumn, this dwarf conifer will brighten up any space. Growing to just 0.8 x 0.8 metres in 20 years, Juniperus horizontalis Lime Glow spreads low to the ground and has up-reaching branches that add great architectural appeal whether it is planted within a bed or used as a small specimen shrub. Lime Glow Juniper is tolerant of both urban pollution and drought once it has established, but does not like having wet feet, so is suited to a free-draining site. A position in full sun to partial shade will suit this colourful ground covering Juniperus variety. Our pot grown Lime Glow Juniper trees can be planted at any time of year. Firstly, remove weeds and grass within a metre of your desired planting hole, then dig a square hole as deep as your root mass and approximately 2x as wide. To help Juniper establish more effectively, sprinkle Mycorrhizal root grow in the hole. If you’re planting Juniper trees in spring, summer or dry weather, water well and regularly for the first few months. Keep an eye on young trees and increase watering if there are extended periods of hot or dry weather. If you’re planting in autumn, you may only need to water your tree a little. We also stock a range of irrigation kits, suitable for a variety of planting schemes. Once planted, it is important to keep the area free of competing weeds and grass for the first couple of growing seasons. Using a glyphosate based weed killer or installing mulch matting and bark chips will aid in this. Ornamental Juniper trees do not require a lot of pruning. Simply remove any dead, diseased or awkwardly placed branches from your Lime Glow Juniper tree as and when you see them.